Nourish and protect the delicate eye area with AHAVA Extreme Firming Eye Cream; an anti-ageing, antioxidant-rich formula that utilises natural extracts from the lowest and highest points on earth - the Dead Sea and the Himalayan mountains. The brand's patented blend of Dead Sea Minerals (Osmoter™) are combined with nutrient-rich plant extracts that survive harsh Himalaya conditions to form The Extreme Complex™, which helps to minimise the appearance of wrinkles, whilst improving firmness and elasticity. Shea Butter and Hyaluronic Acid deliver long-lasting moisture and hydration, as Icelandic Moss soothes and calms for long-lasting comfort. The lightweight eye cream absorbs quickly into skin to promote a smoother, younger-looking eye contour with improved texture and tone. 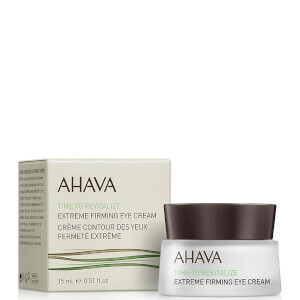 Apply morning and night by using ring fingers and gently pressing the eye cream onto skin around eye. Start at outer corners, working your way below the eye to the inner corners and on/around lids (coming full circle back to where you started).